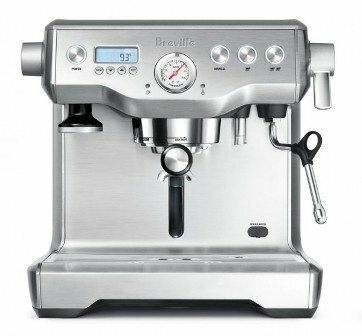 When you are seeking a feature-rich pure espresso machine that can give you a feel of real barista, Breville does coins up. Few of the Breville machines that have gained enormous popularity are BES870XL, BES900XL and BES920XL among which the latter 900 series is also referred to us Breville Dual Boiler (BDB) machines. Here we are going to get closer to the latest 920XL which is known as among one of the best machine by many coffeeholics. Breville BES920XL is a feature packed espresso that gives amazing results. It’s not a super automatic machine rather it’s a semi automatic and is priced slightly above in the segment. If one is seeking for a quality machine that can give consistent results over time, BDB can be a great option. The reason behind the consistent results is its amazing boiler system. This machine is often compared with Saeco super automatics because of it’s shoulder to shoulder price points. Anyways, let’s get into depth of Breville starting with it’s features. The machine actually has 3 heating systems to give stable temperature– the first one is grouphead heater of 100w, the second one is espresso boiler of 700w and the last one is steam boiler of 900w for steam output. 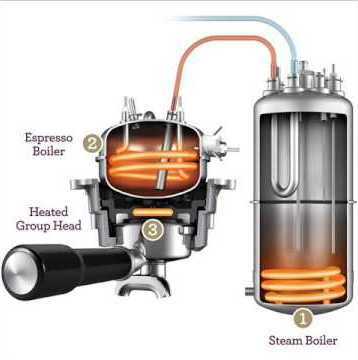 As there are separate boilers for steam and espresso, the machine can steam and prepare espresso at the same time. There are electronic temperature controllers to give stable temperature throughout the brewing process. 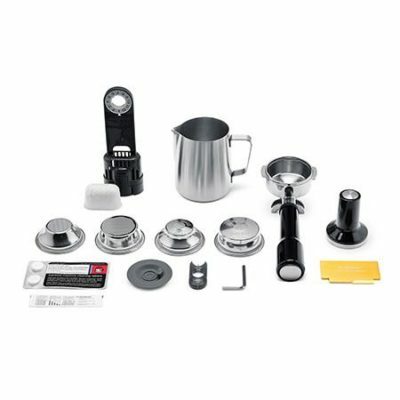 This Breville comes packed with almost all the accessories that are required to start with. It has bottomless as well as standard portafilter, two pairs of single/double baskets and a magnetic tamper that rests near to the grouphead. Even a pitcher is included. One doesn’t have to worry about the extra purchases required with this BDB as almost everything comes with it. Though the LCD system looks small, it includes all the required information for brewing a great cup of coffee. The menu system is well structured for easy understanding and operation. Few of the settings that can be tweaked are brew boiler temperature, steam boiler temperature and preinfusion time. The BDB comes packed with utmost care and attention. The Styrofoam packing ensures that the machine arrives at destination without any hiccups. Cheers to the Breville for great packaging. After unpacking, clean and rinse the water tank, portafilter, baskets, pitcher, tamper and steam wand. After that, fill the water tank, turn the machine on and set the water hardness level with the help of provided strip. The machine will take around 10 minutes to come at stable temperatures. Flush a few times through group head, steam wand and the hot water tap. That’s, you are ready to brew a cup now. Adjustable pre infusion time, brew temperature, steam temperature and shot time. Overall, for this price point of $1300, this machine is outstanding. None of the machines allow adjusting brew and steaming temperature along with the pre-infusion time. The machine requires some understanding and practice, but after gelling up, you are going to love it.